If you are like me, you know a couple princesses. Let me give you a tip. The little ones love this thing. And, the big ones are so happy when you get this for your little princess’s birthday party. So in short, 2 princess’s very happy, and you didn’t have to scale a castle wall. I call that success. 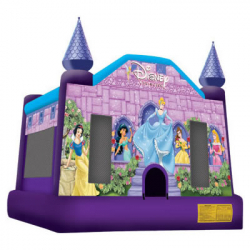 Our Disney Princess Bounce House makes a perfect party for your little princess. Residential pricing starts at $249 including delivery and setup. Also available for pickup, save $50-$100.